The Pokemon Go Plus is Available. Is it worth picking up? The Pokemon GO Plus has finally landed and most stores have already run out! We’ve taken an in-depth look to find out exactly why the device sold out so fast. As it turns out, the reason for the lack of stock for the Pokemon Go Plus may be more to do with the overwhelming popularity of Pokemon Go, as opposed to the outright success and functionality of the Pokemon GO Plus wristband on it’s own right. With that being said, however, the Pokemon GO+ tool augments a PoGo player’s experience in a few interesting ways. Below I have explained exactly how the PoGo+ works, what it can do and why it may be useful. The PoGo+ is small enough to be worn with the wristband or held in the hand with comfort. You’ll feel confident that the thing isn’t going to go anywhere anytime soon. The Pokemon GO Plus tool itself is roughly the same size and weight as a wrist watch, and the wristband material is flexible with an adjustable size. The Pokemon Go Plus vibrates and flashes to signify Pokemon and Pokestops. The Pokemon Go Plus connects via Bluetooth, but the method required to make it work is a little complicated. To begin with, you must pair it to your smartphone by pressing the single button on the PoGo+ and the pair button on your smartphone. After that, go to the Pokemon Go app on your phone and select the Pokemon Go Plus option within the settings menu. You will then need to pair with the PoGo+ a second time, but this time from within the application. Once you’re paired up, you will receive a notification on your phone to let you know that the pairing was successful and you’ll always see an icon on-screen to let you know that the Plus is still connected. User interaction with the Pokemon Go Plus works solely on vibrations and a blinking LED light. It can be hard to get used to the different vibrations and light flashing to begin with but I found that after a few hours of gameplay, translating each vibration into an action in the game comes a lot more naturally. The PoGo+ hasn’t got a pedometer inside, but it can track steps for your eggs, your buddy goals and your achievements. It does this by ‘pinging’ your device to keep it’s GPS state active, even when the display is turned off. Can the Screen be Turned Off? New Pokemon Go appearance options may be available in the future. That’s right, the Pokemon Go Plus allows players to keep their smartphone turned off whilst playing the game. This single feature alone is perhaps the biggest selling point for the PoGo+ – not only can you keep the display off to save huge chunks of battery but you can also keep a better eye on your surroundings at all times. Like mentioned before, the Pokemon Go Plus can track walking distance but it doesn’t have a pedometer inside, although you may have heard different elsewhere. Instead it uses a ‘low power’ GPS mode borrowed from your smartphone. As a result, the walking distance has, if anything, the potential to be less accurate than what you’d get whilst walking with your smartphone out. Pokemon Go Plus device can detach from the wristband. You can catch Pokemon and use Pokestops with the PoGo+. The Pokemon Go Plus uses a variety of vibrations to let you know different things. Firstly, if your PoGo+ makes three long vibrations, it’s signalling that a Pokemon has appeared nearby. If at this point the PoGo+ LED flashes yellow, it’s telling you that you have not caught this Pokemon yet. You’ll need to pull out your phone to catch any new Pokemon. In other cases, however, you’ll be able to click the button on the PoGo+ to attempt to catch the Pokemon. Once you click the button, three vibrations will play on the device to signify that you have thrown a Pokeball. The vibrations also mimic the wobbling of the Pokeball. If the three vibrations are cut short, the catch will have failed and the Pokemon will have fled. On the other hand, you’ll know that you’ve caught a Pokemon when the device vibrates quickly five times and the LED flashes multiple colors. One very important thing to be aware of is that you’ll only get one attempt to catch a Pokemon with the PoGo+. 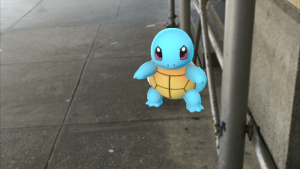 If the catch fails, the Pokemon will always flee. On top of this, you can only use Pokeballs with the Pokemon GO Plus – the device will never throw Great Balls or Ultra Balls, even if you’ve run out of Pokeballs. All the Pokemon Go Plus features could be implemented into the main app. You end up feeling a bit ripped off. Activating Pokestops on the PoGo+ works similarly to catching Pokemon, although there are different ranges of vibrations to tell you different things. When you walk past a Pokestop, the PoGo+ will have three pairs of quick vibrations, or a total of six vibrations. You can click the button on the PoGo+ at this point to collect items from the Pokestop. After a click, the number of vibrations to follow will signify how many items you’ll receive. If your bag is full, a single long vibration will occur instead. The vibrations aren’t too loud, although if the Pokemon Go Plus is close to you, you’ll certainly hear it and feel it. Since update 0.39.0, both lures and incense will work with the Pokemon Go Plus. If you have either a lure or an incense activated, the vibrations will work the same as with any other Pokemon spawn. The Pokemon Go Plus uses one of those coin shaped CR2032 batteries, which are inexpensive to replace. Battery life has been listed as 100 days worth of use, but we’ll have to give it a few months before we see whether that holds up or not. You can clip the Pokemon Go plus to your clothes, use the wristband or hold it in your hand. The retail price of the PoGo+ is $39.99. You can keep an eye out for stock on Amazon here. The Pokemon Go Plus is definitely not a tool that’s absolutely necessary, although it may benefit those that are on the lookout for a tool that can keep the Pokemon Go show running whilst their display is turned off. All of the features of the Pokemon Go Plus are very useful, but they could be implemented straight into the main app itself. The PoGo+ is an example that the smartphone GPS can still work with the display turned off, and smartphones already have vibrations and LEDs that could mimic the same functionality that the Pokemon Go Plus has. I never had my hopes up for the Pokemon Go Plus but it did better than I expected. With that being said, it still doesn’t offer any functionality that smartphones don’t already have available. You do end up feeling… a little ripped off.